While sitting in the library on Hog Island that first summer, Kress pulled a book off the shelf: Maine Birds, written by the renowned Smithsonian ornithologist Ralph Palmer. This research bible includes species-by-species accounts of all the birds that have ever been sighted or nested in Maine, including those that have become extinct. When Kress got to the entry about the Atlantic puffin, he was stunned by what he read. The description made reference to nearby Eastern Egg Rock, a desolate, treeless island, six miles south of Hog Island, and noted, “the puffin bred on these rocks.” Those six words changed his life. Puffins had been extinct on Eastern Egg Rock since their extirpation by hunters and fishermen nearly a hundred years earlier. Puffins, like some other seabirds, are philopatric, which means they breed only in the places where they are reared. Because no puffins had reared their young on Eastern Egg Rock since their extinction there, none would ever nest again unless chicks recognized the island as their natal site. Within a year Kress had sketched out a concept plan to translocate newly hatched puffins from another colony to nesting burrows on Eastern Egg Rock, where they would be hand-fed and cared for until they were ready to paddle out to sea. Kress’s long-term plan was for these young puffins to return to Eastern Egg Rock as adults and reestablish a breeding colony. I first met Kress ten years after his first summer at Hog Island. I was enrolled as a student in the National Audubon Society’s natural history field course in 1979. I had been hired to collect baseline ecological information on the 200 privately owned islands Hurricane Island Outward Bound School had permission to use, and hoped to get a crash course in field ornithology from the diverse and talented instructors at Hog Island. Three years after Kress originally floated his plan, the Canadian Wildlife Service agreed to provide six puffin chicks as a pilot project to see if they could successfully be hand-reared. Kress collected the chicks himself from a large colony off the coast of Newfoundland. Kress, a redoubtable problem solver, worked out the complex logistics and successfully raised five of those first six chicks, which scrambled into the Gulf of Maine one night at the end of that summer. This modest success led to an agreement for the Canadians to supply a total of 1,924 chicks over 16 years. By 1978, Kress and his field team of hardy and adaptable field biologists had established an admirable track record of successfully raising the transplanted Newfoundland puffin chicks, but only a few returned to fly by Eastern Egg Rock before choosing to nest at existing colonies, on Matinicus Rock or on Machias Seal Island in Canadian waters. Part of the problem was that marauding gulls discouraged puffins from landing on Eastern Egg Rock. These elegant-looking predators are exceptionally tenacious. Despite the best efforts of Kress’s team to dislodge them from Eastern Egg Rock, and some expert marksmanship among island biologists, the hungry gulls still lurked around the island, feeding opportunistically on seabirds and their chicks. When I arrived on Hog Island in 1979, six years after the project began, Kress was trying not to be disappointed that he hadn’t yet seen signs of puffins nesting on Eastern Egg Rock. Hoping to “think like a puffin,” he reasoned that puffins might not come ashore without some additional encouragement. This approach led to adopting hunting decoys, mirrors, and, later, audio recordings into his seabird conservation strategy. Kress remembered how a mirror in the cage of a pet parakeet he had as a child had captivated the bird, which inspired him to rig up a four-sided mirror box and set it amid the decoys to stimulate interaction among puffins that might land to check out their wooden cousins. Sure enough, puffins began hanging out by the mirrors, occasionally pecking at their images and settling down next to them for hours. Kress also wondered if attracting terns back to Eastern Egg Rock might be an effective strategy to minimize gull predation. Kress surmised that terns, which nest in dense concentrations and aggressively drive off intruders, might provide puffins opportunity to land and scramble into rock crevices before gulls could catch them. But Kress then faced a complicated new question: how could he lure terns to Eastern Egg Rock to establish a breeding colony? Serendipity and boredom—or at least the avoidance of idleness—sparked an idea in 1978. While waiting for puffin sightings on Eastern Egg Rock, Kress and his crew had busied themselves banding storm petrels, which, like puffins, nest underground in burrows to avoid gull predation. The researchers had begun to record the petrels’ mystical and enchanting underground calls, and in a remarkable intuitive leap, Kress developed a plan to use a combination of recorded tern calls with carved tern decoys to signal that Eastern Egg Rock was suitable for tern colonization. After all, reasoned Kress, hunters used decoys to lure birds to shoot; maybe he could use decoys to attract birds to nest. The combination of techniques, never before tried, was successful. In 1980 terns began nesting on Eastern Egg Rock for the first time since 1936. Kress did not immediately realize that he had unwittingly invented “social attraction” as a new wildlife management strategy. Nevertheless, no puffins landed on Eastern Egg Rock, although the team observed individuals nearby occasionally. By 1981, still without signs of puffin nesting, Kress had begun to question the viability of continuing with the project. Then, on July Fourth, in an event brighter than a sky full of fireworks for Kress, a puffin landed with a fish in its beak, the certain sign that a baby puffin had hatched somewhere in the rocky rubble below. Since then, efforts to refine the seabird restoration techniques that Kress and his crew pioneered on a remote and rocky shore of a small island at the edge of the Gulf of Maine have gone global. Around the world, Kress has documented 128 seabird restoration projects that have been organized to benefit 47 species of seabirds, 59 of those efforts have used decoys and audio recordings. Of the 55 successful reintroductions, Kress notes that 41 employed some combination of chick relocation, decoys, and sound recordings, all of which were pioneered at Eastern Egg Rock, and spread by over 500 of his interns to 18 different countries. The recognition of the wide reach and success of these projects inspired Kress and the Audubon Society to begin envisioning the Audubon Seabird Institute in 2014, whereby young professionals from around the world could be trained during ten-week courses at Hog Island in the latest seabird restoration techniques. When photographer Fred Field and I are invited back to the center of worldwide seabird restoration on Eastern Egg Rock at the end of June, we find Kress overseeing a field staff of 21, 19 of whom are scattered among Audubon’s seven seabird island nesting colonies off the Maine coast. Two others lead bird talks on tour boats, which carry thousands of visitors to Eastern Egg Rock from Boothbay Harbor and New Harbor and also help greet visitors at the Project Puffin Visitor Center in Rockland. One of the biologists, Kelsey Navarre, rows us toward Eastern Egg Rock in an inflatable rubber dinghy amid impressive swells that might make the fainthearted think twice about landing. “It’s all about timing,” Navarre tells us, as she chooses a brief lull to come quickly alongside. Although we scramble up the rockweed slope without major incident, Kress and most of his island biologists have taken unintentional swims in the bracing waters of the Gulf of Maine. Once ashore, we meet Eastern Egg’s field staff, who spend their time counting tern nests and chicks, as well as sitting in blinds documenting puffin feeding forays. By carefully tracking the fish that puffins bring back to their burrows, Kress and his team have documented significant changes in fish populations as the Gulf of Maine’s waters are warming. 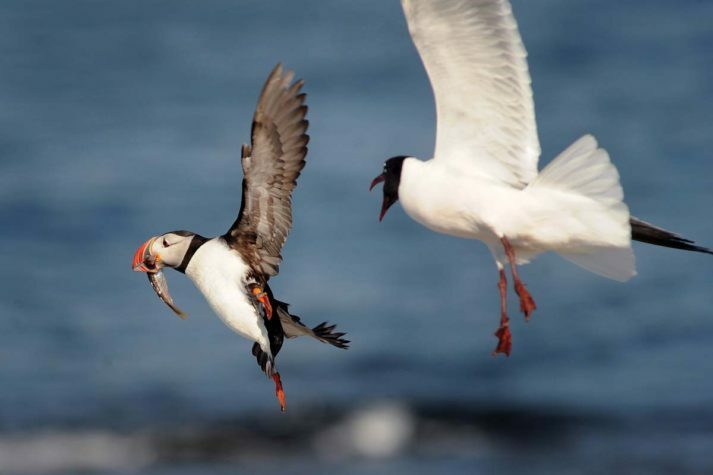 During the past 11 years the project has demonstrated that herring, once a key food for puffins, has been replaced by white hake in the diet of puffin chicks. During the especially warm year of 2012, adult puffins brought home round-shaped butterfish, most common in waters further south, to their chicks, but many had difficulty swallowing them and nesting success plunged. One impetus for Kress’s plan of creating the Audubon Seabird Institute is the recognition that it is no longer possible to reestablish puffin or other seabird colonies without ongoing human stewardship. Just this summer field biologists found a raccoon on Seal Island National Wildlife Refuge, which could have made short work of the puffin chicks. Previously, a mink on Eastern Egg Rock wreaked havoc in the puffin burrows, and gulls that follow lobster boats remain an ever-present threat. “We have to recognize that humans have transformed the ecology in the Gulf of Maine, so if we want puffins here, we will need people on nesting islands to protect them,” says Kress. Another goal of the Seabird Institute originates in the dilemma that faces many organizations founded by a charismatic entrepreneur. How does an organization, which aspires to exist in perpetuity, plan for the fact that its founder is not immortal? For more than 40 years, Kress has not only been the chief tinkerer, testing and tweaking methods of colony restoration through incessant trial and error, but he has also been the project’s chief spokesperson and fundraiser. With an annual budget for the puffin project now well north of $1 million, most of which Kress raises himself, the project needs someone to manage the complications of day-to-day operations while Kress concentrates on ensuring a successful financial transition for the next generation of leaders. But Kress has begun to have success in raising a significant endowment fund to cushion the transition to a future without his charismatic leadership. As we head back ashore, we ask Kress whether he believes puffins will still be nesting on Eastern Egg Rock in a hundred years, given the changes he has already seen affecting their food supply. “Environmental change is about chance and the speed of it,” says Kress. “If the changes happen slowly enough, perhaps puffins can adapt. Otherwise they will move.” Squinting into the sun sparkling off the waves of Muscongus Bay, he adds, “Environmentalists have to be hopeful; otherwise there is no hope."